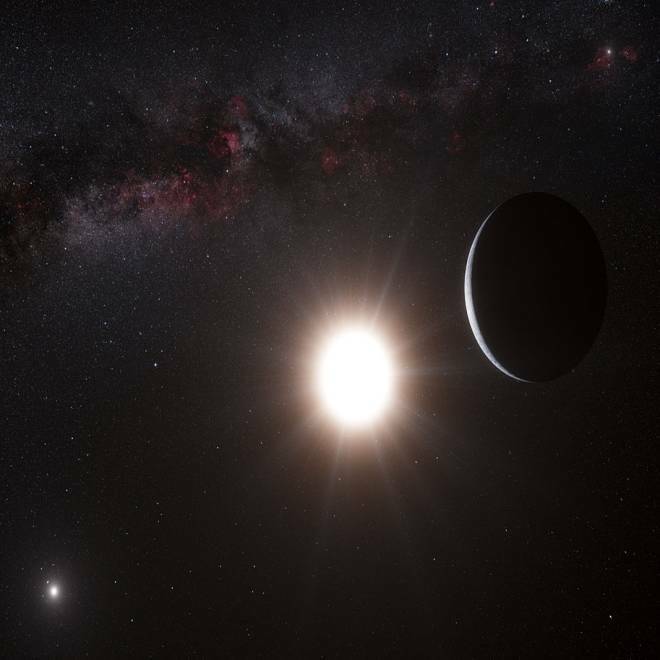 An artist's conception shows the planet Alpha Centauri Bb, orbiting one of the stars in a nearby triple-star system. A commercial venture known as Uwingu says it will use proceeds from a contest to give Alpha Centauri Bb a new name to support endangered educational and public outreach efforts. NASA's plan to suspend educational and public outreach activities due to budget sequestration has sparked protests from some of the space agency's biggest fans, and a commercial venture known as Uwingu wants to help fill the gap. Uwingu says it will direct proceeds from its contest to name the closest exoplanet toward projects that are facing budget cuts. The venture was set up last year to offer space-themed entertainment that would raise money for education and space science. Just last week, Uwingu kicked off an effort to come up with a "people's choice" name for Alpha Centauri Bb, an Earth-sized planet that was detected last year just 4.3 light-years away. It takes $4.99 to nominate a name, and 99 cents to cast a vote. The contest closes on April 15, and the winner will be announced the next day. Some of the proceeds will go toward paying the company's expenses, but the target is to put at least half of the money into a fund to support research and education. When the company made its public debut, the founders said the Uwingu Fund could serve as a lifeline for scientists and educators if NASA's budget ran into a rough patch. Sequestration certainly qualifies as a rough patch: The automatic spending cuts will force NASA to scale back its budget by roughly $900 million for the fiscal year. As part of its plan to comply with sequestration, NASA officials on Friday ordered the suspension of educational and public outreach activities, also known as EPO. Planetary scientist Alan Stern, Uwingu's CEO and a former NASA associate administrator, said the suspension has put educational and public outreach programs "under severe and sudden stress." "At Uwingu, we believe that private and commercial funding of space-based initiatives — including research and EPO — is more important now than ever," Stern said in a statement Monday. "That's the purpose of The Uwingu Fund, which is fueled from people participating in the naming contest for Alpha Centauri's planet. Today we're announcing that Uwingu is taking action to combat the severe, adverse impact of sequestration on NASA EPO by directing all Uwingu Funds proceeds raised through this contest to grants to EPO professionals and projects." In the grand scheme of things, education and public outreach aren't the most expensive things that NASA does. The continuing resolution that governed spending for the current fiscal year set aside $137 million for the agency's education account, and sequestration would trim that figure by $7 million. NASA budgets additional funds for public outreach on a mission-by-mission basis, but the expense is still a small proportion of NASA's $17.8 billion budget. Friday's move nevertheless sparked an outcry from many who rank education and public outreach among NASA's strongest suits. Over the weekend, more than 4,500 people signed onto an online petition urging the White House to "repeal" the EPO spending cuts. "This is something that hits extremely close to home, and not just because I may not have a position this summer as a result of this," Scott Lewis, media director for Astrosphere New Media Association, said in a Google+ posting. "NASA's education and public outreach is something that opens the eyes of thousands, if not millions of people, to the magnificence of science, technology, engineering and mathematics." One of the ventures that could be affected by the budget cuts is CosmoQuest, an online educational project that sponsors virtual star parties, citizen-science projects and similar activities with NASA support. Pamela Gay, a professor at Southern Illinois University who is CosmoQuest's project director, said the effect on funding is not yet clear — but she's already preparing for cutbacks. "I'm looking at multiple fundraisers," Gay, who is on Uwingu's board of advisers, said in a Google+ posting on Sunday. "While I'm less worried about CosmoQuest than I was yesterday, it is clear that many good people in the NASA EPO community are deeply in jeopardy. I continue to encourage you to help us seek donations so that I can recover as needed from any cuts we incur, and, as additional funding allows, work to contract people who do lose their jobs to help us build new and amazing things for CQX. I'm hoping you will help me build a safety net for our community." Correction for 3:55 p.m. ET March 25: I referred to Scott Lewis as an astronomer at Citrus College — which prompted this email from Lewis, a.k.a. "The Bald Astronomer": "I'm not an astronomer at Citrus College, but a student there. I am, however, media director for Astrosphere New Media Association, on the education/public outreach team for CosmoQuest, owner of KnowTheCosmos.com, and an all-around attractive man. haha."